Enjoy all the health benefits of whole body acupuncture with a focus on looking and feeling younger, healthier and more vibrant! Acupuncture Facelift, as a form of non-surgical face lift has recently become a mainstream alternative to surgery and Botox. 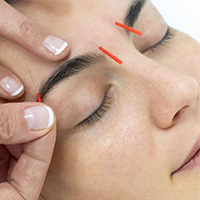 As a Registered Acupuncturist, with extensive experience in Acupuncture Facelift, serving Yorkville, Toronto, the GTA, Woodbridge and Vaughan, Eileen Fauster of Essential Balance can help you enjoy the potential health and cosmetic benefits of Facial Acupuncture. Video: 3:24 - 4:18 (Iridology), followed by a Facial Acupuncture demo. Madonna, Cher, Angelina Jolie, Jennifer Lopez, Sandra Bullock, Jennifer Aniston, Robert Downey Jr. and Gwyneth Paltrow. 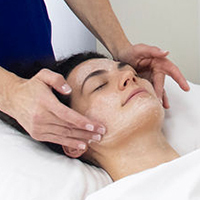 Acupuncture facelift treatments may help increase local collagen production, which can reduce fine lines and reduce the appearance of wrinkles. The inserted needles may also increase blood circulation, which may allow for better delivery of nutrients to the face, which may improve facial muscle tone, overall skin tone and a more even colour. What can I expect after a series of treatments? Disclaimer: We cannot and do not guarantee results. Individual results may vary, as per age and lifestyle. 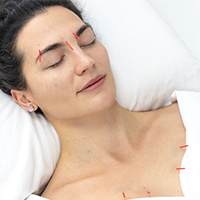 We can guide you on improved lifestyle habits to enhance your facial acupuncture treatments. 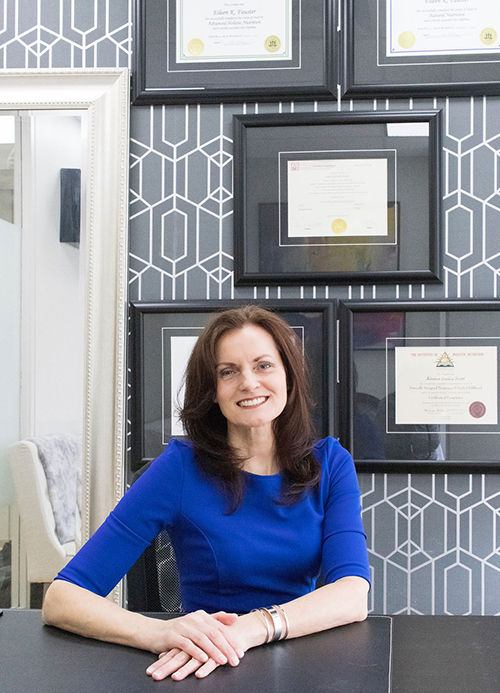 Eileen Fauster, is a Registered Acupuncturist with the Province of Ontario and has many years experience in Cosmetic Facial Acupuncture / Acupuncture Facelift. Facial Acupuncture or Acupuncture Facelift has been performed in China since the Sung Dynasty more than 1,000 years ago when it was performed on the Emperor’s concubines. The Acupuncture Facelift treatment (aka Cosmetic Acupuncture, Facial Acupuncture) may delay the process of aging. Although cosmetic acupuncture is a process best started at a young age, improvements may be seen in those starting later. Facial acupuncture may prevent and reduce lines and wrinkles, and is beneficial to maintain healthy, glowing skin for years to come. As we age, recurring facial expressions, combined with a thinning of the skin and declining collagen production, cause muscles to leave their marks on our faces as wrinkles – the furrows between our eyebrows and those crow’s feet at the outer corners of our eyes. Meanwhile other under-used muscles begin to lose tone and sag, such as the areas around our jaw, chin and neck. Acupuncture face-lift may slow down this process, using very fine needles which are inserted superficially into acupuncture points on the face to improve skin texture, smoothness, clarity and tone. 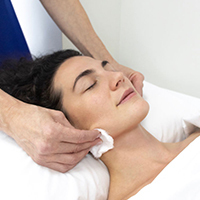 Facial acupuncture supports the overall health of the body with a focus on revitalizing the face. What can I expect from Cosmetic Facial Acupuncture / Acupuncture Facelift? Cosmetic Facial Acupuncture may erase as many as 5-10 years from the face. Results can last up to 3 to 5 years. An acupuncture facelift may be an effective anti-wrinkle treatment; it may improve skin tone, smoothe out the complexion and tighten pores. Do you have Dry skin? Or Acne? Improved circulation and facial detoxification from this anti-aging procedure may correct and balance these issues. You may expect to experience a deep relaxation and sense of well-being even after the very first treatment. As acupuncture facelift is a full body health treatment, the results may reflect not only a change in your external appearance, but also an improvement in total body wellness and slow down of the aging process. Does Cosmetic Facial Acupuncture hurt? Cosmetic facial acupuncture is relatively painless. 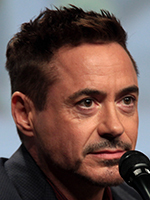 Areas of the face with a rich nerve supply (eg eyebrows, nasal labial fold) are more tender. Acupuncture has no side effects. It can happen that a small light bruise appears at the site of needle insertion, however these incidences are seldom and any discolouration will clear up in a matter of a day or two. Why should I choose Cosmetic Facial Acupuncture over Facial Fillers, Botox or Cosmetic Surgery? As Cosmetic Facial Acupuncture increases in popularity, many are reconsidering their surgical options. 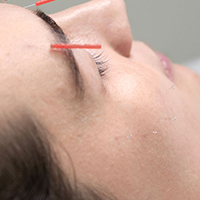 Cosmetic Facial Acupuncture may enhance and prolong the effects of past surgical procedures. 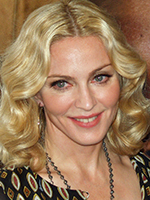 What is the best age to begin Acupuncture Facelift treatments? For those in their 20s and 30s, now is the time to start to improve skin tone and prevent any lines! 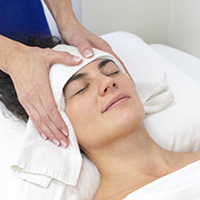 What is the duration of each Cosmetic Facial Acupuncture/Acupuncture Facelift treatment? There is no down-time after a treatment; you are free to carry on with your day. How many treatments do I require? What is the recommended treatment plan? In order to achieve maximum results recommended are a minimum of 10 treatments, to be completed 1-2 times per week for best results. Following the initial course of 10-12 treatments, monthly maintenance sessions may prolong the results for years. That's just a 10-hour commitment to looking younger! Treatments are scheduled twice a week for 5 weeks. If you need results faster, ask about other possible schedules. Will my Extended Health Insurance Cover the Cost? Anyone who wants to delay and slow-down the aging process. Anyone who wants to look and feel younger. Anyone who wants a natural face-lift to maintain their youthful-looking facial skin, increase their self-confidence and self-esteem. Are there any contra-indications for Acupuncture Facelift? Is it safe for everyone? Cosmetic Facial Acupuncture is not recommended for those who are pregnant, although it is considered totally safe for lactating women.